The Great Highway Gallery is excited to present To What Depths, site specific installation, drawings, video and photographs by Amy Tavern. When I first read these lines in Stephen Hawking’s A Brief History of Time (1988) I was brought to tears. They were the most beautiful and saddest words I had ever read. In that moment, I had to turn away from the book. The subject matter had become too much for me to take. I was flooded with thoughts of mortality, remembering and forgetting, loss and longing. I understood that as we stand in the present and look up at the night sky we are literally looking at the past: the past made visible, the past becomes the present, the past is present. To What Depths investigates ideas around time, parallel worlds, and psychological spaces by finding symbolic reference in the ocean and the Universe. I philosophically and poetically approach concepts of physics – such as the multiverse, dark matter, and the speed of light – observing similarities between them and in connection to what it means to be human. The shared experiences of love and loss, triumph and failure can make us feel as if we are living in another world, separated from the familiar and everyday, or experiencing unexplainable duality. Direct observation of the ocean and the stars informs my imagery, resulting in visuals that are interchangeable and represent both entities at the same time. Through a variety of traditional and exploratory multi-media techniques, I deconstruct and reconstruct personal recollections, pairing them with poetic interpretations of space and time. I use a distinct vocabulary of crooked, curving, and perfectly straight lines, amorphous shapes, and nuanced blues to abstractly illustrate my thoughts on space, time, and emotion. Mixed-media drawings, layered photographs, a glitch-focused video, and a sculptural installation appear to be pools of salt water, islands in the sky, portals into space, or glimpses inside imaginary bodies. They suggest the ocean is a universe, reality exists in another world, and the past is visible in the present. Two books of single line poetry complement the group, adding another layer to the narrative while pulling the reader into the past present. Amy Tavern is an interdisciplinary artist. She has exhibited nationally and internationally with solo shows in the United States, Belgium, Sweden, and Iceland. She has taught and lectured across the country and in Europe, and her work as a metalsmith has been included in numerous publications, most notably, the cover of Metalsmith Magazine. A believer in phenomenology, her work begins with direct experience and, although autobiographical, refers to the human condition, universal themes, and the passing of time. 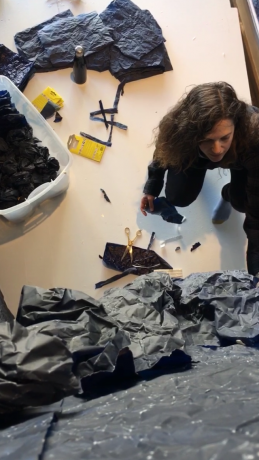 Using labor-intensive methods, Amy translates recollection through drawing, photography, sculpture, animation, and video. Originally from Richfield Springs, New York, Amy holds a BA in Arts Administration from the State University of New York College at Fredonia, a BFA in Metal Design from the University of Washington, Seattle, and an MFA in Fine Arts from California College of the Arts in San Francisco. 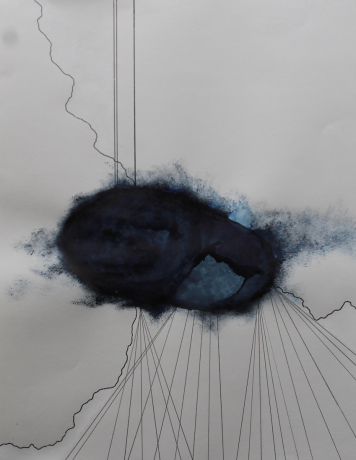 Amy is a former Penland School of Crafts resident artist and has completed numerous artist residencies in Iceland. Amy lives and works in San Francisco, California. 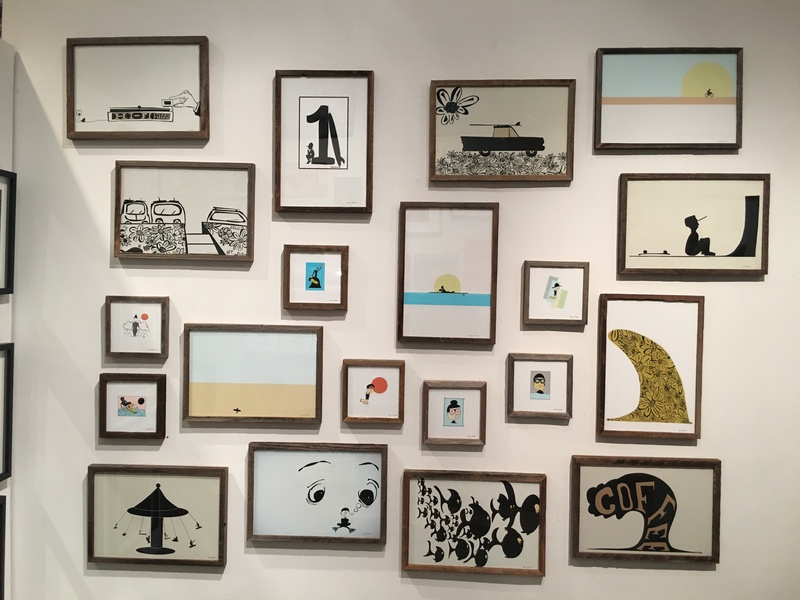 The Great Highway is a fine art gallery located in San Francisco’s Outer Sunset district. The gallery was founded by John Lindsey, a long time resident of the city with a deep appreciation for images and ideas that explore the intersection of land and water in contemporary work. The Great Highway Gallery’s mission is to seek, analyze, support, and promote the work of a diverse group of artists who seek sincere authenticity, challenge conventional thinking, amuse us, and push the boundaries of today’s creative media. To learn more about the gallery, visit www.thegreathighway.com. The Great Highway Gallery is excited to present I’ll Take You There, paintings and drawings by Jane Fisher. War is God’s way of teaching Americans geography”-Ambrose Bierce I am part of a generation of Americans born never not knowing of Vietnam. The on-going conflict there was as much a part of my childhood as Captain Kangaroo, Gumby, and The Monkees. The nightly body counts, the scenes of destruction on the evening news, and our parents’ expressions of anguish over such a pointless war was part of our daily routine. I’ll Take You There features work based on my travels in Vietnam, primarily the coastal town of Nha Trang. In recent years it has evolved into a premiere Russian tourist destination, a place where thousands flock all year around. The town has become a dialog between these two cultures. The signage is mainly in Vietnamese and Russian, with only the occasional bit of English. Russian visitors lounge on the beach, working diligently to achieve their perfect sunburns, breaking only occasionally to chase down a souvenir hat or some sunglasses. Meanwhile the locals go about the business of living their lives. To an American, Nha Trang can seem like a parallel universe, a Twighlight-Zone-esque tableau. One of the dominoes fell! They defeated us in war, and now they play host to other Godless Communists as they cavort on the beaches! Fifty years ago, one would have been hard pressed to imagine such a scenario. And yet, here we are. The reality is both more mundane and more pleasant. This Marxist dystopia includes lovely beaches, superb food, and many kind people. And in a strange plot twist, the Russians have become the Ugly Americans, rarely engaging with local culture, too absorbed in their own temporary escape. The juxtaposition of these two cultures meeting on a beach, as seen by an American, is the focus of this show. Jane fisher is a figurative artist who has been exhibiting work in the bay area and nationally since the 1980s. Jane received her BFA from Ohio University and received a Master of Fine Arts degree from The Art Institute of Chicago. She lives in Oakland and is a Professor of Art at Diablo Valley College in Pleasant Hill. Endearing and intelligent illustrations from a fine gentlemen.